Atlantic Championships 2015 – relive the best moments! 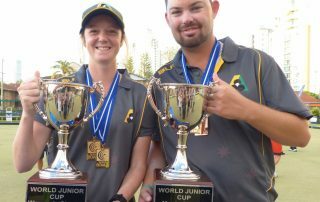 2015 Asia Pacific Bowls Championships Burnside & Papanui, Christchurch NZ Day 12: Finals: Women’s pairs: Australia (Kelsey Cottrell, Karen Murphy) bt Malaysia (Emma Saroji, Siti Zalina Ahmad) 16-11. 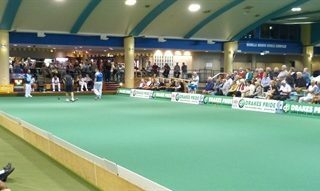 Men’s fours: New Zealand (Mike Nagy, Andrew Kelly, Shannon McIlroy, Paul Girdler) bt Australia (Wayne Ruediger, Ray Pearse, Nathan Rice, Mark Casey) 16-14. 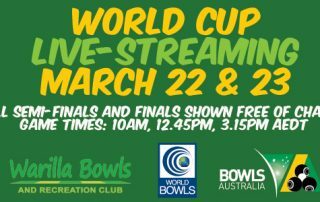 2015 World Champion of Champions Club Helensvale, Queensland, Australia Results of play on Day 7: Men: Semi finals: Fairul Muin (MAS) bt Pete Bonsor (ESP) 3-9 6-4 3-0, Neil Mulholland (IRE) bt Scott Thulborn (AUS) 9-5 3-8 3-2. Final: Mulholland bt Muin 10-10 8-3. Women: Final: Emma Saroji (MAS) bt Nici Neal (RSA) 9-3 9-8. 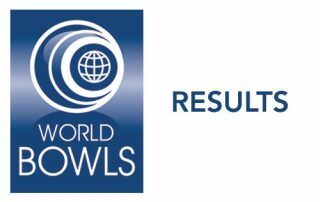 2015 World Cup Singles, Warilla Bowls Club, NSW, Australia, Day 9 Results Day 9: Men: Semi final 2: Iain McLean (SCO) bt Todd Priaulx (GUE) 6-10 11-6 4-0. Women: Final: Siti Zalina Ahmad (MAS) bt Julie Forrest (SCO) 11-4 12-5. Men: Final: Iain McLean (SCO) bt David Holt (AUS) 9-4 6-6.